I have a 4 months old cute German Shepherd puppy named Rambo. I've had him for two months and, during this time, he went from 10 pounds to 40 pounds. He is so big now and getting more handsome as he grows. The only problem is that he won't look like a true GSD without his ears up. BTW, my pup is ACA registered and I know for a fact that he is a purebred puppy. How long will it take for Rambo's ears to go up? Are there GSDs whose ears don't go up? I am attaching a picture of Rambo, taken a few days ago. 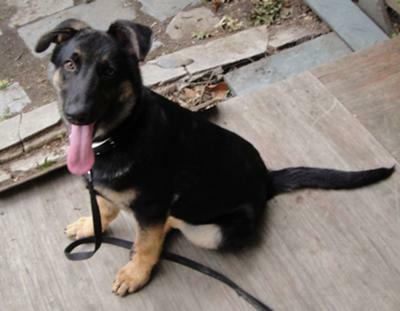 Total German Shepherd: Most German Shepherd puppies ears go up before they're 4 to 5 months old. But that's not always true for all German Shepherd Puppies. Some German Shepherd puppies need additional attention and in that case you can try to help them up by taping up your German Shepherd Puppy ears. Think of it in kind of the same way as "training wheels" for kids just learning to ride a bike if you'd like. Only these taping are helping to train the ears to stand. And sometimes, even after trying all of this, the ears of a German Shepherd Puppy may not stand on their own. That's just the way it is and this is called soft ear. My suggestion to you would be to talk to your breeder or vet about how to tape up your German Shepherd Puppy's ear right now or read the article on this site about taping German Shepherd Puppy ears right now. Good luck. Several people advised me to tape my puppy's ears when they didn't go up by the age of 6 months. I was afraid to do it, so I asked my vet what to do. He advised me against it, so I didn't do it. I was a bit nervous about this, but my puppy's years went up when he turned 7 months old. I was so happy! IMO, a GSD is so much more beautiful with his ears up.